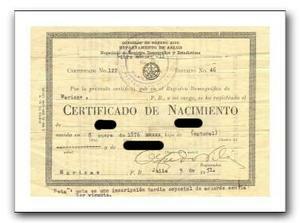 Easy-to-obtain Puerto Rican birth certificates are a hot commodity among identity thieves. The Puerto Rican government has decided to do something about it: All Puerto Ricans born before 1 July will need to apply for a more secure replacement before the old birth certificates are voided on 30 September. Over the weekend, the Puerto Rican government granted a 3-month extension for invalidating the certificates from 1 July to 30 September, but the cutoff date for voided documents still applies to those issued on or before 30 June, according to The Providence Journal. Matthew Harwood writes that starting Thursday, the island will begin issuing security-enhanced birth certificates. More than five million natives of the territory, 1.4 million of whom live inside the continental United States, must now reapply for the new birth certificates under a Puerto Rican law passed in December in collaboration with the U.S. Departments of State and DHS. The law only aims to make it harder to get false documents in the future, but does nothing to target those already in circulation. And a person holding a stolen birth certificate could conceivably apply to receive one of the new ones, which will have special seals and be printed on counterfeit-proof paper — though they would have to present other personal data that they might not have, McClintock said. According to Allentown, Pennsylvania’s the Morning Call , 40 percent of all passport fraud cases start with a stolen Puerto Rican birth certificate.40 percent of all passport fraud cases start with a stolen Puerto Rican birth certificate. Identity thieves have targeted Puerto Ricans because their names provide the perfect cover for Hispanic illegal immigrants entering the country and are worth as much as $6,000 on the black market. The documents are so valuable that drug addicts trade them for a fix, the AP reports, while a Puerto Rico-based FBI agent said he worries these documents could be used by terrorists. The U.S. Defense Department will also now require new Puerto Rican service members to have the new certified birth certificate to enroll for military benefits. Current service members will be encouraged to get new birth certificates but will not be required to do so to continue receiving benefits, reports the American Forces Press Service.